With holiday season upon us, I would like to take this opportunity to inform you of all the fun holiday activities in our community, some as early as TONIGHT! In total, there are 29 events throughout the town scheduled over four days. For a complete list of the events, click here. To view a list of community events, click here. 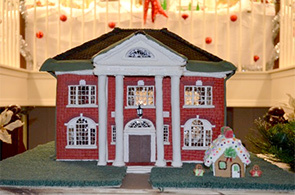 The Wood Library & Museum’s Annual Gingerbread House Festival will be running at the museum through Dec.10. I invite all residents to visit and take a look at these very unique gingerbread houses! The museum, located on 783 Main St., will be open on Mondays, Thursdays and Fridays, 10 a.m. – 8 p.m. and Saturdays and Sundays, 10 a.m. – 5 p.m. Admission for this festival is free and there will be special visit from Santa on Friday, Dec. 2 from 5-8 p.m.
To learn more about this festival, click here. Now is your chance to skate with Santa and his elves! The event will be held Sat. Dec. 10 at the South Windsor Arena (585 John Fitch Blvd.) from 6-7:30 p.m. In lieu of admission cost, it is advised that you bring an unwrapped toy that will be donated to Toys for Tots. On Sunday, Dec. 11, from noon to 3:00 p.m., parents are invited to s to bring their children to the Pleasant Valley Schoolhouse Museum, located on 771 Ellington Rd., for its annual holiday visit with Mr. and Mrs. Claus. There will be gifts for the children and refreshments, Parking and admission are free. First Responders will join favorite holiday characters to light the Downtown Manchester Tree tonight from 6:30 to 7:30 p.m. on the Lawn of St. James Church, 896 Main St. Performances by the Silk City Barbershop Chorus and the Ensemble from the Salvation Army Band will follow while everyone awaits the arrival of Santa. There will also be complimentary hot chocolate and a light show. This free event sponsored by Wickham Park will occur Dec. 10,11, 14-23. The event will run from 3-6 p.m. weekdays and 1-5 p.m. on weekends. Children of all ages can enjoy visits with Santa and his elves and refreshments with Mrs. Claus. Guests are welcome to bring non-perishable food items to be donated to area food pantries. Bring your family to the Nathan Hale Activity Center at 160 Spruce Street from 6 to 7:30 p.m. to enjoy family fun activities! Families can create a snowflake garland, participate in a snowball toss or paint a winter wonderland! Share some pizza and soda with Santa on Dec. 11 from 1:30 to 4:30 p.m. at Saint James Church Hall, located at 896 Main St. Pre-registration is required by Dec. 5. To view all community events, click here.